The Frenchman has hit back at his critics after a section of supporters unfurled an ‘Arsene out’ banner. 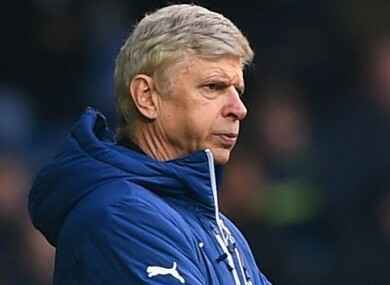 Fans have criticised Wenger for his decisions this season. ARSENE WENGER HAS launched a staunch defence of his managerial ability after a section of Arsenal fans displayed a banner calling for his resignation. Despite beating West Brom 1-0 on Saturday, a banner was unfurled at full-time, which read: “Arsene, thanks for the memories but it is time to say goodbye,” with supporters frustrated by the club’s lack of silverware in recent years. The Frenchman has hit back at his critics, though, citing his remarkable record of having qualified for the Champions League knockout rounds in 15 consecutive seasons as proof of his ability. “I started to manage a team at the top level in 1983. If I am completely useless tactically, I am a genius [because] I can hide it very well,” Wenger told reporters. “Look, in [each of] the last 15 years, we are qualified for the last 16 in the Champions League. Give me another club who has done that. I think we have shown extreme consistency and that’s all we can do. “We’ve had ups and downs in the league — yes, it’s true, but you only come back again when the spirit is strong and healthy and united inside the club. Wenger insists that he was not affected by the banner displayed at the Hawthorns and is confident he is still the right man for the job, even if he no longer has the full support of the Arsenal fanbase. “I can do my job,” the 65-year-old added. “I do my job with total commitment, I would like people to live with me and see for seven days what kind of work we produce, and you will see that it is total commitment. Email “Wenger: I must be a genius to have hidden my tactical ineptitude for so long”. Feedback on “Wenger: I must be a genius to have hidden my tactical ineptitude for so long”.